I might be crazy. Apparently that’s the way the NY Jets like it. 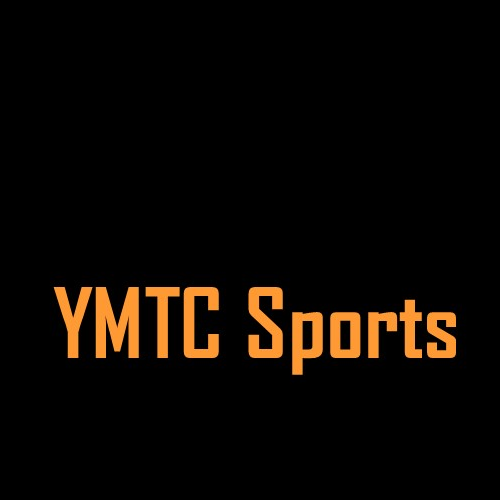 An NFL preseason that has already seen one or to fracases entered the Tyson Zone Tuesday morning as I got a tweet form Yahoo! Sports that Jets QB Geno Smith suffered a broken jaw from a sucker punch. I started getting more tweets, from reputable sources even. I Googled IK Enemkpali and learned to spell his last name. I read from Neil Paine how the Jets will be better without their purported starter. That sounds like crazy talk, but Neil uses good data and this whole situation is ludicrous anyway. So let’s go further off the rails and posit: missing 6 – 10 will make Geno a better QB. 2015 NBA Finals Review + Bonus NBA Draft Edition! You’ve heard all the stories about the Finals. How the Warriors went small and changed the complexion of the Cleveland defense. How LeBron and his tattered supporting cast finally ran out of steam. How Steve Kerr pushed all the right buttons while David Blatt bumbled his way. The inspiring story of Andre Iguodala going from starting lineup to bench to Finals MVP. I want to hit on that last point a little though. We’ve all heard the training camp stories when Kerr had to tell Andre that Harrison Barnes would start at small forward. I think it’s naïve to think that Andre would have caused a riot in the Warriors’ locker room; he’s too much a professional for that, he wasn’t much more a team vet than Kerr, and the Dubs had just come off a disappointing first round loss to the Clippers (though it was a good Clippers team that should have taken the Thunder to 7). After a nervous start from both sides, this turned into quite the fun game. I’m not going to tell you what happened, but want to see what we learned from the game and what implications it has for the series. Of course, none of this is possible without knowing the status of Kyrie Irving’s knee. It was tough to see him go down with what appeared to be limited contact – those are often the worst type of knee injuries. But he did walk off. I’m hoping for a DeMarre Carroll-type recovery for Cleveland’s exciting point guard – he’s good enough to take over one of these games by himself. So before we begin, big prayer for Uncle Drew. Both teams started off running good sets. Cleveland’s offense has devolved into one long LeBron isolation, but there creative ways to give him the ball and creative ways to move pieces around him once he gets it. The Cavs are actively cutting and screening on offense, which can prevent the Dubs from helping effectively. But the Dubs defense is just an amoeba. It’s incredible to see them shift with the help, pointing out cutters, neutralizing threats and recovering. The communication is superb. I'll admit that this is the Finals I wanted to see. As fun as the Hawks were, they just didn't finish the season right. They should have been sitting guys in January to rest them for the playoffs, not because that would have kept them healthier, but because it showed long term vision and awareness compared to the rash of DNP-CDs they racked up in April and May. And the Cavs beat them. They were the best team. Atlanta had no answer for LeBron and couldn't press its advantage at point guard. Something tells me the Warriors will be able to do that. Steph isn't on every game, but when he is, it's incredible. He snuffed multiple Rockets/Grizzlies runs with spectacular shot making. That is going to be a problem for Cleveland - I just don't think Kyrie's knee gets better very quickly. Everything I know about tendinitis is that it's a long-term injury. Add that to the foot injury, and his already poor pick-and-roll defense, and the result is a player the Cavs will have to hide on defense. Problem is the Warriors have few safe harbors. Klay will shoot over him. So will Barnes. Green would bully him and you can't treat Bogut like Noah. The Dubs would be more inclined to yank Bogut and go small anyway. The bench is no better - Livingston will abuse him and Andre might offer more as a 2-way player at this point. Man, that bench. Steve Kerr can act magician with those guys. Need defense and rim protection? Ezeli. Post production to buy Green/Bogut some minutes? Lee. Perimeter defense. Ball handling from Livingston and Barbosa. A dash of shooting. Lots of switching. Meanwhile, David Blatt will turn to J.R. Smith, James Jones, and Matthew Dellavedova. Shawn Marion can't get in the game. Neither can Mike Miller. With those logistics, I see only one way out for Blatt: Muck the game up. Slow it down. Extend your (and their) starters. Bully them in the post with LeBron and crash the offensive boards for extra possessions in a low-possession game. The problem with that plan is the Warriors can play it too. Harrison Barnes showed me in the Grizzlies series that he can not only defend the post (with help), but crash the boards too. Kerr worked magic with his bench to find combinations that would work when Green got in foul trouble. David Lee had to guard Gasol, but Gasol was gassed by Game 6. Is Timofey or Tristan that worse of a matchup? And I know the Grizzlies were close in those games, really close, but so were the Warriors in their losses. And once Kerr figured out how to best the Grizzlies, it was over. I think if the two teams played 10 games now, the Grizzlies would be lucky to win 3. That's why I think the Warriors win this series. I know Cleveland is clicking on defense and LeBron is a force the Warriors won't be able to prepare totally for. He has been the most reliable player of his generation. Getting to the Finals for the last few years has basically correlated to having LeBron on your team. He's incredible. But slowing the game also makes every Curry three that much more a dagger. Every go-go Warriors run has that much more impact on the game. And they go on runs. They will. They'll speed you up when you want to go fast and when you don't. When they're hot, nothing can stop them. And when they're not? Their defense, depth, IQ, chemistry, and confidence can beat you anyway. In 2015, the Thunder lost 14 more games than they did the previous year. The Thunder, according to Kevin Pelton, also lost 19.2 wins above replacement to injury this year. They lost 14.4 wins from Kevin Durant's injury alone, measured by the year over year change in his win shares. The point? The Thunder didn't miss the playoffs because of Scott Brooks. It was a minor miracle that Brooks was able to keep his team together, adjust on the fly, and give the Western Conference shivvers at the prospect of playing his Thunder squad. The major differences between this year's Thunder and the teams that made deep playoff runs in past years are injuries and luck. That sounds simplistic or misleading, but it's true. Last year's bunch survived a seven game first round series against Memphis on the back of some timely shooting and good luck. The next round, they won in six against the Clippers, a series that may have been decided by a few bad calls. Would Brooks have been fired if they had lost in the first round instead of the conference finals? Scott Brooks hasn't really changed in three years. He still manages his team well. He's gotten better at rotations, though still fails to make adjustments quickly. He still doesn't know what a modern NBA offense looks like but his guys play hard on the defensive end. He's the same guy. If you thought Brooks should have been fired two years ago, then today is a belated vindication, and a sad one since the Thunder have missed out on two years of potential development. But if you thought that Scott Brooks was a good coach a year ago, then he's still a good coach now. He's the same guy. My point isn't to defend Brooks. My point is that the process behind his firing is indicative of everything that's wrong with the league's darling small-market team. By firing him now, Sam Presti is acknowleding that he knew - he knew his coach was holding the team back - and did nothing. He sat by because the Thunder were getting lucky and going on playoff runs. He sat by as his players went through a streak of injury luck before the wheels fell off in the worst possible way. He watched the Thunder waste the beginning of Durant's prime without a guarantee that Kevin will stick around for the end of it. Presti took two seasons too long to decide to part with his coach, and that has had a cascading effect on the franchise. Forget the Harden trade. They had their reasons for that. Over the last two years, the Thunder have gone from timid (keeping Brooks and Kendrick Perkins too long) to panicked (trades for Dion Waiters and Enes Kanter). Instead of trusting whatever process he sold himself on two years ago, he's gone off-script. And that tells me Sam Presti may need to go. He has done great things for this franchise, and has Durant, Russel Westbrook, Serge Ibaka, and Steven Adams to show for it. But those were decisions made under the auspices of the broader plan. He isn't so good at improvising - just look at what happened with Harden. Maybe he can get his mojo back. But my guess is that with Kevin Durant's free agency looming, the Thunder will be forced to think more about results than process. They'll be forced to go against everything that made them the NBA's small market template. I really hope that they can get it together and keep Kevin. I think the Thunder make the NBA better. I hope that Presti can take a deep breath, trust the process, and reboot. 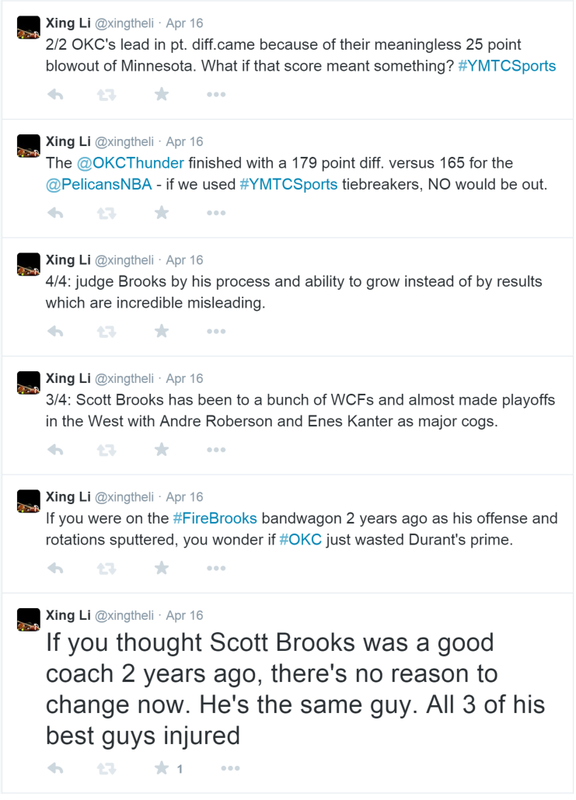 I will admit that part of me will miss decrying Scott Brooks and his decisions on Twitter. Here's hoping that he, too, can get back to the big stage. Atlanta Hawks. I did not like the way the Hawks ended their year. Yeah, a few guys were banged up – is it possible that’s because they were playing at half speed, trying not to get injured (obviously I’m speaking of guys other than Thabo Sefolosha). They would get up for marquee games, like a late matchup with the Cavs, but otherwise coasted with that huge lead for the 1st seed. And I hated it. Full disclosure – I had Kyle Korver and Paul Misap on my fantasy team, and they killed me in the semifinals with DNP-rests. But compare this to how the Warriors finished the year. Sure the warriors had guys miss games too, but for the most part they kept everything going. Momentum in sports is notoriously hard to quantify, so much so that it doesn’t exist. But I believe that there is something to the notion of the hot team, the team that peaks in May and June. It’s like when you play pickup and your team wins two or three in a row – you get fatigued, but you also build a nice chemistry, you start figuring out what each person can and should do. Maybe Atlanta will be fine – of course, they will win their first round matchup easily and possibly their second as well, considering how Washington and Toronto are playing. I’m just concerned that after a few weeks of playing disjointed lineups, the defensive rotations won’t be as crisp and the ball won’t fly as fast on offense. Just a half game separates 2nd through 6th place (with the Blazers in there because of their division). This inevitably begs a question: What happens if there's a tie? Some of you will remember my post from this summer about better championship hardware. I was pleasantly surprised when the NBA announced a change to their jerseys to reflect championship pedigree, simlar to what national soccer teams do to reflect world cup wins. But after watching the product in action this season, I think they need to tweak the concept a bit. You see, everyone on a team that's won a title gets the patch. So everyone on the Bulls gets patches. That's right - the last time the Bulls won the title, MJ was hitting basketball shots in Utah, not golf shots. You see the disconnect - it cheapens the meaning of the notch. Thankfully, this problem can be rectified, and the jerseys made cooler, very easily. I'm not going to wax poetic about Jusise Winslow's NBA draft position or Coach K's ridiculous ability to win titles 25 years apart. Others have written all you need to know about that. Instead, here are 10 things I’ll remember from the 2015 NCAA Men’s Basketball Tournament. 1. The Hunters and Georgia State. Like many, I was at work during much of the round of 64, constantly refreshing gamecast, listening on radio, and occasionally tuning in to good games on the March Madness app. I turned on Georgia State – Baylor with about 1 minute left thinking the Bears would probably win with FTs but hoping for some magic. That was a good decision. Gamecast failed to convey how much the atmosphere had changed in that game over the last several minutes, how Georgia State’s press and shot making started to transcend into the mythical. That’s why, when R.J. Hunter pulled up from deep, my first feeling was of trepidation. This is a tough shot – he’s going to be lucky to draw iron. Then, as the ball hung in midair, I thought differently: if this team goes down, this ain’t bad way to go. Turns out I was right. The ball didn’t draw iron. It did send the team and stadium into a frenzy, the coach off his stool, and the GSU (insert name) into the second round. That was the shot of the tournament. 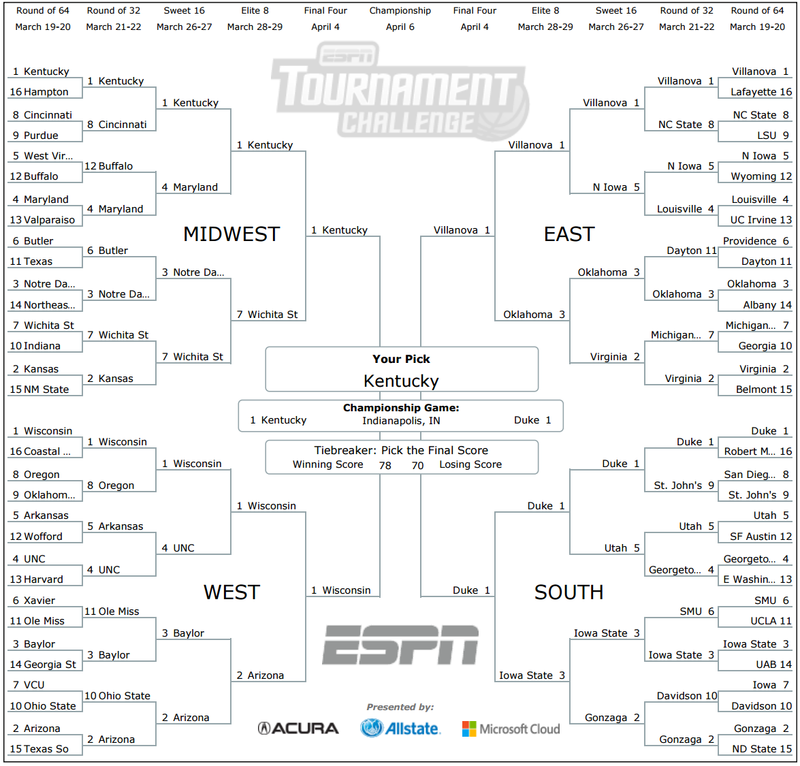 I know - anybody can make a bracket. But does everybody post it online for public ridicule? If you did, post a link in the comments! WARNING: This post is extremely long and deals with a very complicated subject - what it takes to win in the NBA. A TLDR version can be viewed here. For those that read on - I warned you! What a season for the Cleveland Cavaliers. Early season excitement gave way to frustration as the team fell below .500 multiple times. When LeBron went to Miami for 2 weeks to fix his ailing back and ankles (the first such break since a wrist injury sidelined him at the end of his first Cleveland stint), it seemed to portend a lost season (and possibly more). Then LeBron came back, dropped 33 on the Suns (though in a loss, the 6th straight at the time), and generally looked like LeBron again. The Cavs acquired some defense (Timofey Mozgov), shooting (J.R. Smith) and depth (Iman Shumpert), Kyrie took a leap, and the team went on a tear. Not lost during in the cycle has been the play of Kevin Love, who admitted to having to make big adjustments. The season has been a struggle with him posting 5 year lows in major statistical categories, missing the All Star game, being referenced in a bizarre tweet from LeBron, and getting benched in crunch time. There have even been some ridiculous rumors that Love may not re-sign in Cleveland this summer (ridiculous because it is not the right time to speculate about that, unless you’re Goran Dragic). The trade the Cavs made for Love last summer turned out to be immensely polarizing. Before the season I tried to determine Love’s value by comparing him to other players at his position as well as analyzing his effect on Minnesota’s team-wide statistics. My research returned mixed results: Love is undoubtedly oneof the best power forwards to ever play the game, as measured by box score stats. But his ability to affect Minnesota’s team numbers was muted. In fact, I found that of the common box score stats, only half really vary from team to team: 3 point and free throw attempts, offensive rebounds, steals, and blocks. Love’s ability to gather defensive rebounds almost didn’t matter as the best rebounding teams are only a bit better than league average. The data brought up more questions than answers, pointing to the complex, team-oriented nature of basketball. QB Corner is now on YouTube! I felt that even after converting from JPEG to GIFs, the posts were getting too long, and I did enjoy looking at complete games to see how QBs adjusted to the defensive game plan. It's a pretty long video, but at least you don't have to stroll through page after page after page! This week, I'm looking at Colin Kaepernick who has seemingly regressed each year. There are a lot of reasons for that, including the aging of Frank Gore and an offensive line that lost its ability to pass block. My goal is to figure out the root cause of his statistical decline and what he can do to reverse it (if possible). I chose this Week 9 game, a loss at home to the Rams, because it exemplified many of the issues the offense encountered throughout 2014. Not only did they only score 10 points (and after scoring 3 on the first drive), they gave up multiple sacks and only had two really big passing plays (both on the last drive that ended in a missed TD call and a Kaepernick fumble into the end zone. See the conclusion, including strengths and weaknesses after the video. Enjoy!